The story of Joint Admission and Matriculation Board (JAMB) and the evolution of its income remittance to the federation account from a paltry total sum of #52,000,000 in its 40 years of existence to #7.8 Billion in a year still bewilders anyone that is interested in the Nigerian education sector, particularly after the organisation under its present registrar, Professor Ishaq Oloyede, declared an income of #9 Billion, which is equivalent to about 17,000% increase within a year compared to what the institution had been able to remit to the federal government in its then nearly 40 years of existence. And as expected, the government has chosen to weaponise the achievement but it is yet to conduct a comprehensive audit of the past financial records of the institution. However, in any functional and accountable system, a significant difference in remittances within a year like that of JAMB – from zero (no) remittance to the federation account in 2015 to #7.8 Billion in 2016 with an additional #1.2 Billion to be remitted later – would have led to a comprehensive auditing of the institution’s previous financial dealings. Tirelessly, we will be telling this story continuously, in 40 years of its existence, JAMB remitted only N52 million, under President @MBuhari in one year it generated N9 billion and remitted N7.8 billion to the Federal Government. What is JAMB mission statement? Is it to pursue a relentless & aggressive revenue drive or to conduct credible entrance examinations? Moving away from Nigeria’s political idiosyncrasies and multiple-name calling, I have documented some of the achievements by JAMB in the last couple of years while identifying some of the fundamental issues that the organisation needs to either attend to or consolidate on, particularly in the areas of conducting examinations and research, and providing free and accessible teaching and learning resources to candidates. Firstly, I’m absolutely against government using public examinations or any other public service to extort money from the people, particularly low income citizens. However, the institution increased its examination fees from #4,500 in 2015 to #5,500 in 2016 but has since reduced it to #5,000 in 2017. This increase and decrease of less than 20% and 10% respectively cannot account for a #9 Billion difference in income between 2015 and 2016, coming from a position of zero (no) remittance in 2015. Even if it is assumed that all the other sources of income – like conducting of internal examinations for big corporations or sales of change of course or institution and direct entry forms – by the institution generated substantial amount of income for the organisation, it would still be almost impossible to cognitively process the humongous disparity in the net incomes from the two financial years – 2015 and 2016. And as regards the issue of higher institutions of learning in the country conducting their own entrance examinations (post-UTME), this has been mired in politics. For more insights on the issue of post-UTME, you can read ‘Why Post UTME must stay’, ‘Students admitted without post-UTME did not meet UNILORIN standard –mgmt’, ‘The New Senate JAMB Policy is Another ‘Killer Dose’ for Nigerian Education’, ‘Education Minister formally band post-UTME’, ‘Senate moves to scrap post-UTME, mandates committee to meet with stakeholders’ and ‘post-UTME’s are illegal, stop them now, court rules’. Likewise, JAMB in the last two years have been undergoing its own institutional reforms. A good example is the issue of 120 cut-off mark and the politics that ensued afterwards. You can read ‘JAMB and the politics of cut-off marks’, ‘Needless furore over JAMB cut-off mark’ ‘JAMB’s mediocre cut-off: an unconventional view’, ‘Dirty Secret in the Cut-Off War’ and ‘2017/2018 Admission: UI, ASUU reject cut-off marks’ on the issue. Also, the institution has harmonised and improved on its Computer Based Test (CBT) provision during this same period and has even further restructured how people choose their options for their potential higher institutions of learning, as well as nipping in the bud some of the nefarious activities of erring CBT centres and examination scammers. Although, there’s the need to improve the system and provide more and better educational support to students from/with: disadvantaged backgrounds and communities, rural areas, special educational needs & disabilities (SEND). 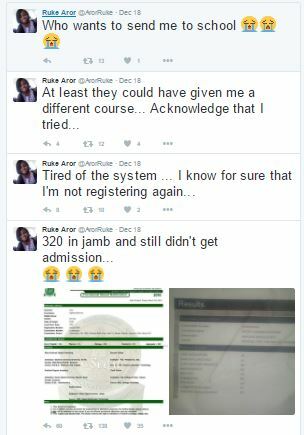 Furthermore, there are other issues to address within JAMB. For instance, I’m of the opinion that JAMB should still conduct paper based test for candidates that want to, particularly those that might have medical reasons to do so or students who have little or no exposure to the regular use of a computer system at school or at home. Also, JAMB needs to develop a repository of teaching and learning resources that educators, families, students, candidates etc. can access for free and use. 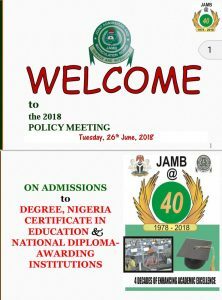 The institution needs to invest in its data gathering and analysing capability and capacity – there’s the need for information on issues like candidate’s: social economic status and home main language of communication, and not just ‘state of origin’; such data will provide education policy makers and educators better insights into some of the challenges some of JAMB’s candidates might be facing. The institution also needs to invest – if it is permitted by the law and is within its provisions – in granting full scholarships to its best candidates on a state by state basis based on place of residence and socioeconomic status and not state of origin. And establishing an endowment fund should cater for such scholarship grants along with the provision of funds to finance future educational research and teachers’ continuing professional development (CPD) in accessing and delivering JAMB’s: curriculum, assessment, examination conducts etc. However, the organisation needs to become self-sustaining and financially stable to start with. All in all, JAMB in its present state has shown that it is possible to achieve tremendous results in Nigeria, regardless of how tough it is to get things going or done in the country. 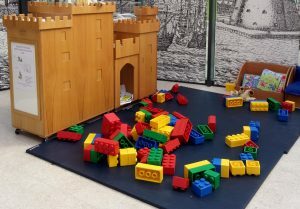 Should children as young as five years old be made to take entrance examinations in order to get into Primary Schools? Well articulated. For the lay man on the street of Maiduguri to Lagos, Sokoto to Port Harcourt, the hope is that the likes of JAMB registrar Prof. Ishaq Oloyede can be reproduced in all “National Interest ” offices.